When Michael Conforto strode to the plate in the second inning, the red-hot Los Angeles Dodgers had every reason to be worried. The Mets were already up 3-0 and had two runners on. Conforto had already homered in his first at-bat. Dodgers’ lefty Rich Hill couldn’t fool anyone with his straight 90 mph fastball. So he threw a curveball, and another, and another. When Hill needed another pitch, he changed his arm angle and threw a sweeping slider to get the strikeout. Great teams aren’t just a collection of great individual talent. They have players and management who are able to make adjustments throughout the season. 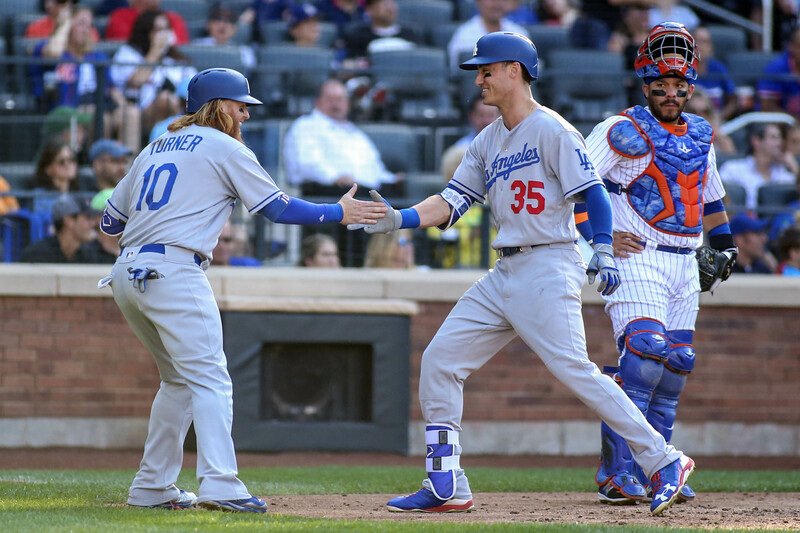 Los Angeles found a way to get the most out of castoffs like Justin Turner and Chris Taylor. Meanwhile, Terry Collins and the Mets seem to keep making the same mistakes over and over again. As the Mets suffered another seemingly inevitable 7-3 loss to LA, it seems like the only people in Flushing making adjustments are the fans. It was a good start to the game at least. Conforto, Wilmer Flores, and Curtis Granderson all homered in the first. Seth Lugo built off the strong end of his last start in Seattle by retiring 14 of the first 15 batters he faced. He relied on his slider more than past outings, commanding the glove side of the strike zone. Everyone thinks about Lugo’s high spin rate curveball, so a tight slider is a surprise. Lugo’s unexpected success gave Terry Collins a tough decision. Lugo had only given up one hit and one unintentional walk. He was at 70 pitches. However, Lugo has allowed 40.6 percent of runners to reach base his third time through the lineup this season. Do you tell Lugo congratulations on five great innings and pull him so he leaves on a positive note? Or do you push Lugo to pitch more and risk a sudden implosion? Anyone who has spent any time watching the Mets the last few years can predict what happened, even if you didn’t watch Saturday’s game. Collins left Lugo in and he lost command of his slider almost immediately. Chris Taylor led off the sixth with a home run. Lugo managed to retire Corey Seager but Turner singled and Cody Bellinger homered to tie the game at three. Collins has never learned when he is pushing one of his starters too far. I would cut other managers some slack, but Collins made the exact same mistake with Steven Matz on Tuesday. Collins trying to squeeze every last out from his starters creates more problems down the line. Lugo ran out of gas so quickly that Paul Sewald had to rush his warmup then come in quickly to try and get out of the mess. He got one out, sat down for the bottom of the sixth, then had to pitch again and immediately gave up a leadoff home run to Yasiel Puig. Since Sewald retired the next three hitters, he got dragged out again for the top of the eighth…and gave up another home run! When you don’t have the best raw talent, it’s even more important for management to put players in a position to succeed. Collins keeps burning his starters and then putting relievers in a position to fail. To make matters worse, he double switched to bring in Sewald. Flores left the game and Jose Reyes came in to hit ninth. Forget Flores’ reputation as a “lefty masher” – his OPS against righties is .161 higher than Reyes. The Mets get nothing from double switching and forcing Neil Walker to play first base for the first time in his big league career. But Collins is obsessed with double switches. Once Collins put his reliever in the fourth spot, he had to make another double switch, removing Conforto from the game. It’s fitting that Travis d’Arnaud – who eventually pinch hit for Conforto’s vacated spot – made the final out.